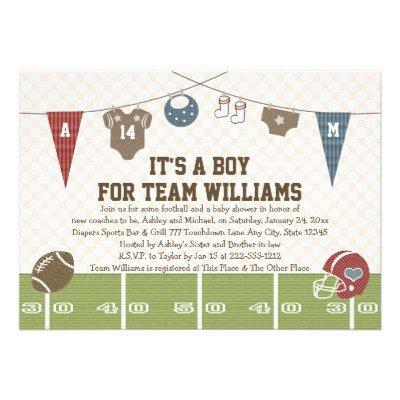 Announce the arrival of a baby boy with these adorable co-ed couples football themed baby shower invitations with a clothesline with a red and blue pennant, baby bodysuit jersey, bib, athletic socks and a pair of cloth diapers hanging over the yard line of a football field. A football helmet and football complete the look of this sports themed baby shower invite. Artwork &#; Chrissy H. Studios, LLC. All Rights Reserved.